EWG scientists reviewed Wet n Wild MegaLiner Liquid Eyeliner, Black (2014 formulation) for safety according to the methodology outlined in our Skin Deep Cosmetics Database. We assess the ingredients listed on the labels of personal care products based on data in toxicity and regulatory databases, government and health agency assessments and the open scientific literature. 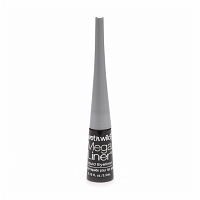 EWG's rating for Wet n Wild MegaLiner Liquid Eyeliner, Black (2014 formulation) is 4. Follow the natural contour of your eyes starting at the inner corner of lid and follow along the lash line. Don't forget to further compliment lashes with wet n wild mascara. WarningsReserve brush for your personal use only. Always replace cap after use. In case of irritation or infection, discontinue use immediately and consult your physician. Ophthalmologist tested and contact lens safe. In case of irritation or infection, discontinue use immediately and consult a physician.